Click here to see a video of a traffic simulation of the one-way grid. With a rapid transit station only 1.5 miles from downtown Boston and surrounded by parking lots and lightly used industrial tracts, Sullivan Square lies ripe for rebirth as transit oriented development. One big hindrance to its redevelopment is the road network, reconfigured in the 1960’s from a historic square into a maze of highway ramps linked by an oversized rotary. The Rutherford Ave / Sullivan Square project, which Boston has been pursuing since 2008 and has now been approved for $150 million in state funding, affords a once in a lifetime opportunity to refashion the streets around Sullivan Square into a pedestrian-friendly grid that will support transit-oriented redevelopment, offer Charlestown residents a safe and pleasant walking route between the neighborhood and Sullivan Station, and make Sullivan Square a destination. The Boston Transportation Department has proposed a new street network for the Sullivan Square area that concentrates traffic on three 2-way roads. It’s an ill-conceived scheme, with wide roads meeting at large intersections – just the opposite of what’s desired for a pedestrian-friendly grid. This report describes the shortcomings of the concentrated 2-way plan and proposes an alternative – a one-way signalized grid that distributes traffic over 6 one-way streets. Offers pedestrians far shorter crossings. Its widest crossing spans 4 lanes (versus 7 lanes in the 2-way grid plan), and most crossings span just 2 or 3 lanes. Offers vehicular traffic green waves in all four directions and excellent service. Average delay for vehicles in the a.m. peak is only 11 s per signalized intersection. Leaves more land available for development because of its smaller roadway footprint. It also makes development parcels more attractive, because none of them are on wide, ugly roads. It should be noted that this report does not question the value of retaining (albeit at a smaller scale) the underpass that allows through traffic on Route 99 to bypass Sullivan Square. The concentrated two-way grid plan that BTD is currently pursuing takes as its organizing concept a desire to give motorists the most direct route. That starting point leads to a grid of two-way streets. On the Everett side, Route 99 surface traffic is concentrated on a two-way arterial (Alford Street) that will be 6 to 7 lanes wide. And on the Somerville side of the square, it converts Maffa Way and Main Street (both of which are now one-way streets) into 2-way streets, forcing them to have additional through lanes plus, at intersections, left turn lanes. A rendering of the 2-way concentrated grid plan, from BTD’s website, repeated with annotation. Sullivan Station is at the left edge of parcel G.
Two-way streets are convenient in some respects, but when it comes to carrying traffic through a grid of closely-spaced streets, two-way streets have three strong disadvantages: (a) they need left turn lanes, making the streets wide; (b) they need left turn phases, which makes the signal cycles long; and (c) they only way the signals can be coordinated is having “simultaneous green” which, together with long cycles, promotes speeding. In the concentrated 2-way grid, streets are wide because they need lanes for both directions, and they need left turn lanes as well. At one intersection in the heart of the square, there are 2 pedestrian crossings of 7 lanes, without a median where a pedestrian could stop partway across; some other intersections have crossings spanning 6 lanes. These new crossings will be among the longest in the City of Boston — although the other 7-lane crossings we’re aware of at least have a median. Long crossings that lack a median island are impassable barriers for slow pedestrians. To call a plan featuring multiple 6-lane and 7-lane crossings “pedestrian-friendly” is to strain the term beyond meaning. In addition to long crossings, wide streets are also undesirable because the vast expanses of asphalt pavement they entail are ugly and create heat islands. By comparison, the one-way grid plan’s widest crossing spans 4 lanes; most crossings span 2 or 3 lanes. Two-way grids need long cycles because they have to include left turn phases, which means splitting time 4 ways. A one-way grid, in contrast, has no need for left turn phases; its signal cycle splits time only 2 ways. The concentrated two-way grid plan will have signal cycles of 100 s or more, versus 60-second cycles with the one-way grid. Average pedestrian delay roughly follows cycle length. At a typical crosswalk, average pedestrian delay will be 45 seconds in the two-way grid plan, versus 13 to 20 seconds in the one-way grid plan. The difference, in terms of pedestrian friendliness, is extreme. Where signal cycles are long, pedestrians and cyclists suffer especially poor service when their route involves making successive crossings at the same intersection (e.g., first cross an east-west leg, then cross a north-south leg). 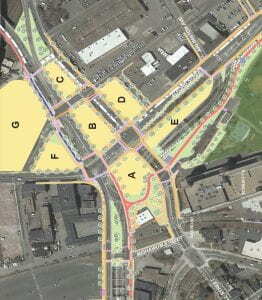 In the two-way grid plan, one of the main pedestrian paths between the neighborhood and the T station involves successive crossings; there, average pedestrian delay will be 75 seconds. 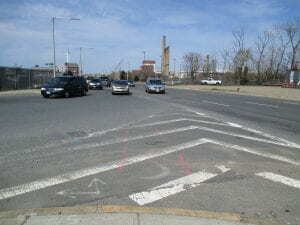 The main bicycling route between East Somerville and Boston involves the same pair of successive crossings, and likewise involves a delay of 75 seconds. By contrast, in the one-way grid plan, average delay for a person making successive crossings is only 29 seconds. In any dense grid, traffic signals have to be coordinated to prevent queues at one intersection from backing up into another. With one-way streets, that coordination can be accomplished by timing the lights to form green waves, with each successive intersection starting its green roughly 15 seconds after the previous one. When combined with a short signal cycle, green waves like this not only provide excellent service for motorists, but also provide a positive means of preventing speeding, because a car that speeds ahead will hit a red light. With two-way streets in a dense grid, it is impossible to provide this kind of green wave. Instead, coordination relies on applying “simultaneous green” – that is, several traffic signals in a row start their green at the same time, and hold the green long enough for traffic to pass through in both directions. This makes green lights visible for several blocks in a row and gives drivers a strong incentive to speed. That’s exactly what we see, for example, on Melnea Cass Blvd, where, outside of rush hours, cars routinely drive 40 mph and faster. Separating a two-way road into a pair of one-way roads means each road can be half as wide. Much more human scale! At the same time, a one-way grid can offer motorists efficient green waves in all four directions. Where the blocks are small, the progression speed of the green wave will be small — in our case, it will be 17 mph. And as described earlier, those green waves also help control speeding. Granted, with a one-way grid, some traffic movements will be less direct. However, for most drivers, the extra distance required will be more than offset by the reduction in delays at intersections. The first key is to limit intersection conflicts so that at each intersection, time is split in just 2 ways, so that the signal cycle can be short. Where a pair of one-way streets meet, this happens automatically. At intersections that interface to two-way streets, 3-way conflicts can be avoided by introducing channelization that allows certain traffic movements to run concurrently. The second key has to do with block spacing, for which there are two seemingly incompatible requirements. For pedestrian circulation, blocks should be small; but for queue management and other aspects of traffic control, longer blocks are desirable. The way these requirements are reconciled is by providing a closely spaced grid, but closing alternating streets to through traffic while keeping them open to pedestrians and local access traffic. (That’s the pattern used in the large downtown grid of Guayaquil, Ecuador’s largest city.) In the core of the SS area, in our proposal, Main Street is closed to through traffic – one block is a footbridge over the underpass, and another is a street that can only be used by local access traffic. But Isn’t there an Urbanist Movement Against One-Way Streets? For the last decade or so, urbanists have advocated undoing one-way schemes that date from the 1950s and 1960s. In many cities, converting streets back to two-way has been credited with lowering speed and improving economic vitality. Why then, in 2018, would somebody propose one-way streets for a transit oriented development? Is the road width staying the same, or doubling? In a typical conversion project, road width is left unchanged; for example, a one-way road with 2 lanes becomes a two-way road with 1+1 lanes. But here in Sullivan Square, the proposed two-way roads have twice as many lanes as the proposed one-way streets. Is the one-way scheme programmed for high speeds or low? Many of the one-way schemes dating from the 1950’s and 60’s have signals timed to advance at speeds of 30 mph or more. However, in our one-way plan, the green wave speeds are 17 mph. A recent study of two-way conversions shows that the highly touted gains in commercial activity are not at all uniform; some two-way conversions have been beneficial and others not. The bottom line is that a great street isn’t determined by whether it’s one-way or two-way; what matter is how wide it is, how fast the traffic is moving, and how easy it is to cross. If making streets one-way pushes those factors in the right direction, then it’s going to be good for business. Click here to see a video of a traffic simulation of the one-way grid. It shows traffic in the a.m. peak, using traffic volumes as forecasted by BTD’s traffic consultant for the year 2040 (and thus accounting for casino traffic). One can see the green waves in all four directions, with traffic flowing smoothly through one intersection after another and without any long queues forming. Where you see crisscrossing footpaths over part of the overpass, the overpass will be decked and covered with a park. On Rt 99 southbound from the northern boundary to West Street, one of the lanes shown is a dedicated bus lane. West Street has been realigned so that it becomes a direct continuation of the bridge over the underpass. On Beacham Street, the blocks on either side of Main Street are one-way, but in opposite directions, with both directed toward Main Street, with both feeding Main Street northbound toward Somerville. 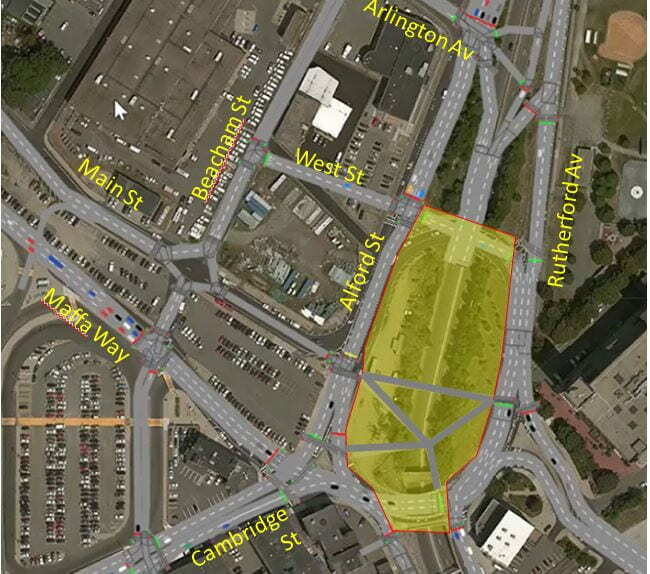 The intersection with Arlington Ave. will allow buses heading to the MBTA facilities there to use the underpass rather than the surface streets. 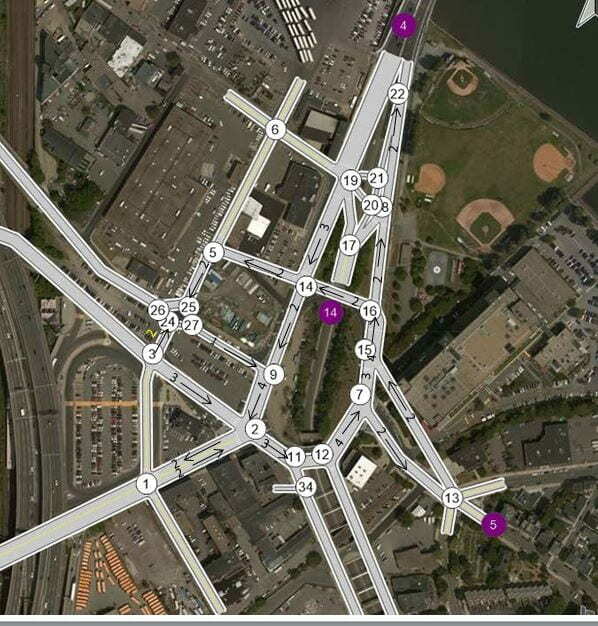 This grid has been designed for easy expansion if and when the industrial parcels in the northwest area of SS — most of which now house MBTA facilities — are redeveloped. When that change takes place, Beacham Street and Dorrance Street can be widened to become a regular part of the one-way grid. The junction of Arlington Ave. with Alford St., Rutherford Ave., and the underpass has been designed so that can handle a substantial increase in destination traffic turning onto and off of Arlington Ave. The one-way grid has plenty of capacity, with all movements at intersections operating at volume capacity ratios less than 1.0. Level of service for motorists is very good, with average delay of 11 s per signalized intersection. Two signalized intersections are rated with level of service C; the rest, A or B. (Level of Service is a scale ranging from A, very good, to F, poor). The one-way grid plan has bridges crossing the underpass at both West Street (for cars and pedestrians) and at Main Street (pedestrians only), while in BTD’s plan, there is only one bridge, at Main Street only (for cars and pedestrians). Having one crossing fewer means that BTD’s plan has a 600 ft gap between the crosswalk at Arlington Ave and the first bridge pedestrians can use to cross the underpass. In the one-way grid plan, that gap is only 300 ft, making the underpass less of barrier to pedestrians who want to access Ryan Park and the waterfront. In BTD’s plan, the primary path from the neighborhood over the underpass is a sidewalk along Main Street, with a 4-lane road on one side and a park on the other. In the one-way grid plan, the primary path is in the same location, but it’s a car-free path in the middle of a park. Steeper Tunnel Ramps – are They Feasible? Locating a road bridge at West Street instead of Main Street means that in the one-way plan, the north-side tunnel ramps will have to be steeper than those in BTD’s plan. 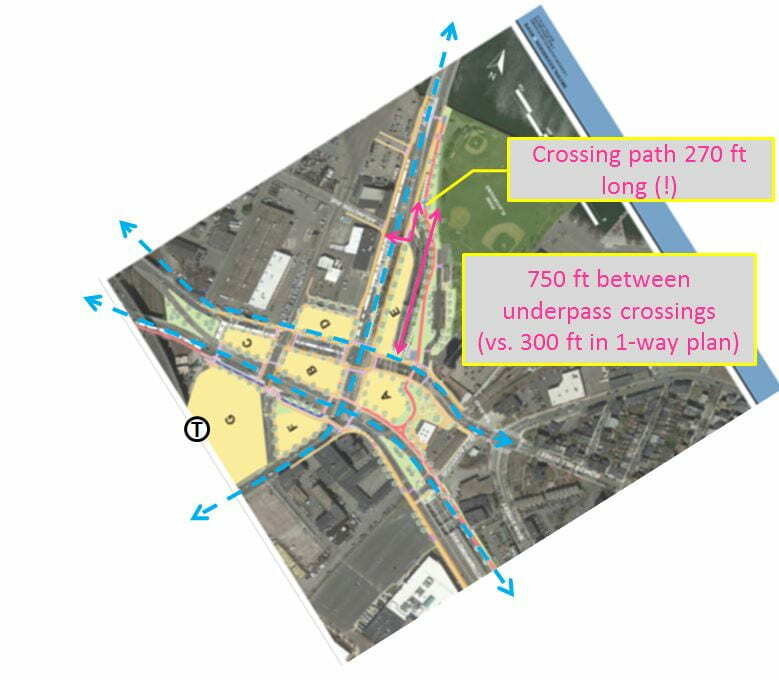 The existing ramps have 630 ft to transition from street level to passing under a bridge; in BTD’s plan, that distance is reduced to about 560 ft (Arlington Ave. to Main Street); in the one-way plan, that distance will be only 315 ft (Arlington Ave. to West Street). Standard highway design calculations show that a ramp is feasible if the floor of the underpass is set 20.5 ft below grade, that is, 1 ft lower than the minimum necessary. The ramp will be 19.5 ft below grade when it reaches the leading edge of the West Street bridge, and will descend another 1.0 ft as it passes underneath West Street, settling out 20.5 ft below grade.